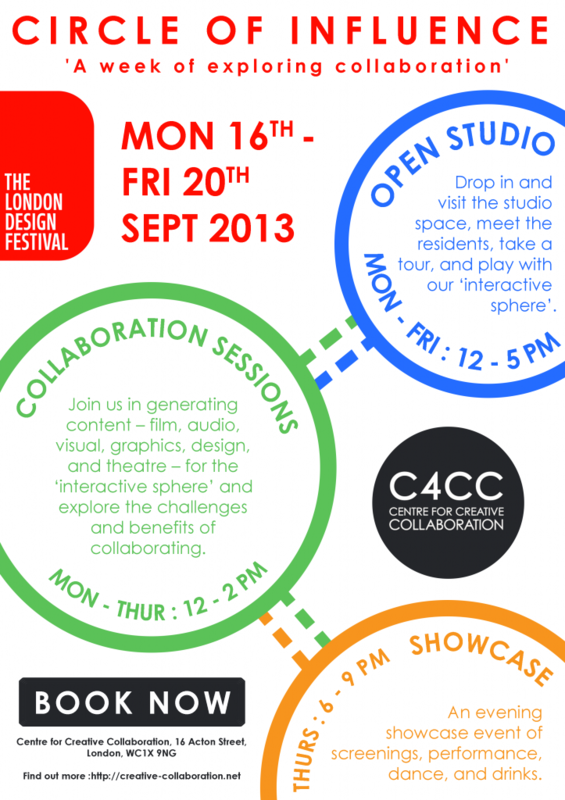 For the first time, the residents of C4CC have come together as a whole to host a series of events for the London Design Festival. Drop into the open studio to explore the unusual space and meet the medley of resident projects; come along to a collaboration session and experience collaboration in action; drop by the exciting showcase evening to see what the week has produced. What’s more, the centrepiece of the week will be an interactive cloud installation in the C4CC’s airy atrium come and manipulate the cloud to suggest collaborative ideas and see what we all do. We can’t wait to see you there! take a tour, and play with our “interactive sphere”. Join us in generating content – film, audio, visual, graphics, design, and theatre – for the “interactive sphere” and explore the challenges and benefits of collaborating. An evening showcase event of screenings, performance, dance, and drinks.